Think tanks offer a valuable addition to academic research. Between the day-to-day commentary of journalism and the year-on-year of academic publication, think tanks provide topical in-depth analysis on essential policy issues. Across the US and Europe, there are easily 50 or more top institutions that provide great analysis, by recognized scholars. In Latin America, Africa and Asia, too, local think tanks have much to contribute. But how to access their work? Going from website to website? Subscribing to feeds or newsletters? Plunging into the vastness of a general Google search? Opening up a dozen tabs? Fortunately there is an easy solution, that might be of interest to LSE students, researchers and also alumns. 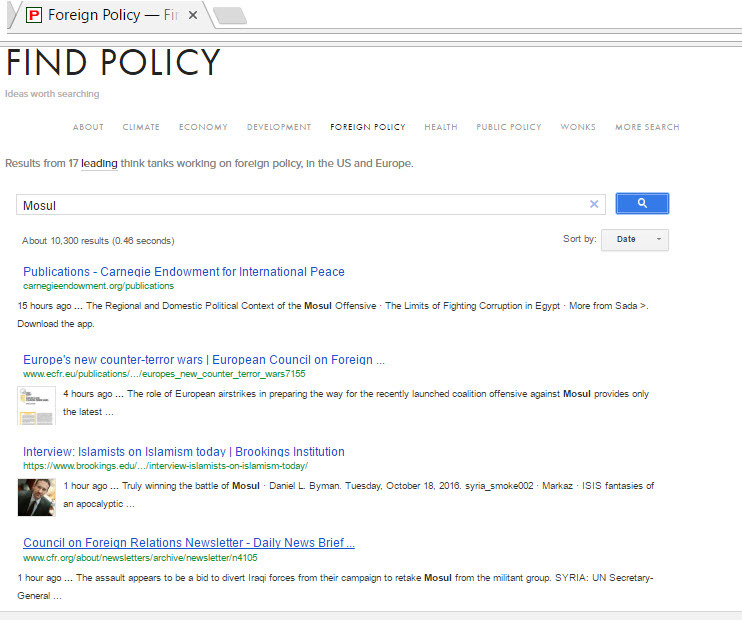 Find Policy, a website we set up after working with think tanks for a few years, focuses search on leading think tanks. It is a bit like Google Scholar, but with a focus on policy research. In Find Policy, you get search pages grouped according to topic, or geographic focus. Of most interest to people at LSE likely are the Foreign Policy search page, and also the country-pages under More Search, which give easy access to think tanks from around the world. You want to see what think tanks in India have to say on Pakistan? How think tanks in South Africa respond to the ascending Democratic Alliance? What German think tanks say on Ukraine? All this and much more is easily accessible, at Find Policy. The more precise your search terms, the better the results. You can toggle from “relevance” to “date” to get the most recent results. The service is and will stay free. (We set up Find Policy for our own use, and are sharing the tool.) We also have even more specialized search, such as the world’s main International Financial Institutions, organizations working on conflict resolution, leading consulting firms and more. Given the size of the US think tank sector (more than $1bn per year for the top 20 institutions alone), there also is a page for searching foreign policy experts. Hans Gutbrod is an alum of LSE’s International Relations Department (B.Sc 1994, Ph.D. 2000). He runs Transparify, an initiative to increase the transparency of think tanks, lives in Tbilisi, and is on Twitter. This entry was posted in alumni news, report and tagged alumni, research info. Bookmark the permalink.